French security researcher firm and famous bug hunters at Vupen announced that it had already developed an exploit that could take over a Window 8 machine running Internet Explorer 10, in spite of the many significant security upgrades Microsoft built into the latest version of its operating system. Windows 8 operating system released last week, and now Microsoft itself has not been aware of security vulnerabilities available in release. 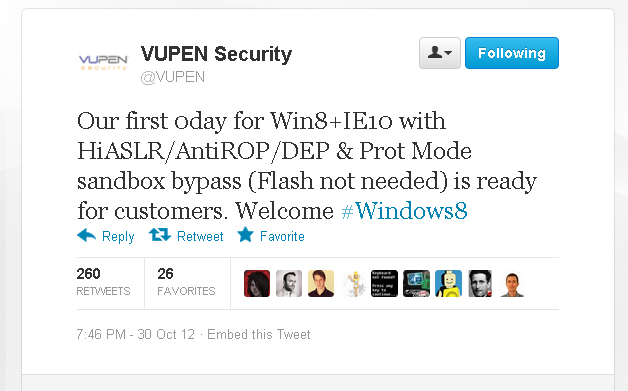 "We welcome #Windows 8 with various 0Ds combined to pwn all new Win8/IE10 exploit mitigations,” Vupen posted on Twitter. “The in-depth technical details of the flaws will be shared with our customers and they can use them to protect their critical infrastructures against potential attacks or for national security purposes,” Bekrar wrote in an email to Forbes. They can sell the exploit even for offensive suppose. Anyway, Windows 8 features several hardware-level security updates, in addition to Secure Boot which uses UEFI rather than a traditional BIOS and loads the Early Launch Antimalware (ELAM) driver.